The Escapist was asked to come to the St. Regis Hotel during GDC 2010 to get a sneak peek at a new action title. Hunted: The Demon's Forge takes place in a beautifully rich environment with which many gamers are familiar, the classic dungeon crawl. The third person action combat focuses on cooperative tactics and the exploration and puzzles you can expect from delving into the depths. While the game is published by Bethesda, it is being designed by Brian Fargo's inXile Entertainment. Fargo, one of the original founders of Interplay, is overseeing development but Hunted is being directed by Maxx Kaufman while the game's executive producer is Matt Findlay. 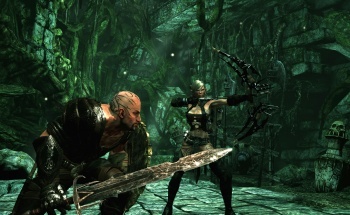 There is no word yet on when Hunted will be released but it is planned to come out on the Xbox 360, the PS3 and the PC. The relationship between Elara and Caddoc is a big part of Hunted. They are longtime partners (but not romantically involved) always looking for a buck and the pair is sent to a town by a strange spirit named Seraphim. The two are close, and you get a sense of their relationship from the quippy things they say to each other, which are really pretty funny. They play against type, with the female being much more bloodthirsty and aggressive while the fighter is more cautious. Elara is an elf and although she can use a melee weapon, all of her special skills are used with her bow, such as frost arrows. Caddoc is a melee fighter and all his skills are close range, but he can wield a crossbow when needed. If the pair bring crystals back to Seraphim, they can both unlock magic spells such as Hellfire which can blow up waves of ghouls or skeletons. You can use the spells offensively like a fireball, or you can use magic to charge up your partner's weapon for a short time. While Caddoc is effective as a front line fighter, Elara must search for high ground to support him. "She has all of the ranged skills, she has a melee attack but it's kind of weak, and they both have the magic abilities in which they are equally powerful," the producer Matt Findlay told us. "It's about how all those things fit together and using the different strategies against the enemies. With all of the enemies having their own strengths and weaknesses, you have to figure what's the best combination of your skills to go take them on." Obviously, teamwork between the two characters is important. Findlay and Maxx Kaufman were playing the demo and there was a lot of verbal communication between the two of them. We heard a lot of "Watch out behind you" and "Here's a shield if you need one" and "I'm down." In the case of the latter, they showed us Hunted's consumable system. You can hold up to 3 potions at one time and, in a nice detail, they are visibly present on your belt. But not only can you drink the potion, you can also throw it at your partner to revive them. Also, Caddoc's shields often get destroyed by enemies and he must replace them by scavenging the battle field.